Some people eat to live… we are not those people | Food E.
My family has many traditions, most of them based on food. I’m pretty sure that when asked “What would you grab from the house in the event of a fire?” my parents would answer the same: the dog and the Adirondack Country Cookbook. I could be blindfolded with my nose plugged and still recognize the taste of the pancakes and the cinnamon swirl raisin bread. Since this cookbook is no longer around (or if it is, PLEASE LET ME KNOW! 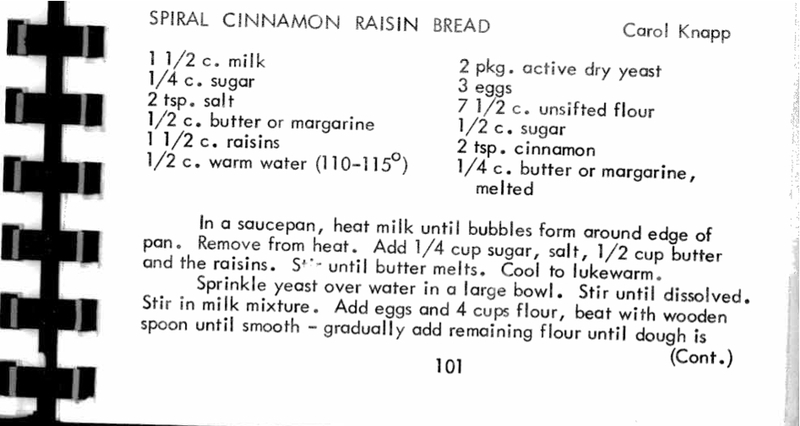 Seriously… we’ve been searching) I pdf’ed the infamous raisin bread recipe, sent it to one of my favorite childhood neighbors, and saved it on my hard drive in case our decrepit old family copy of the cookbook bites the dust. It’s all about preserving the recipes, people. I mean… the memories. It’s all about preserving the MEMORIES. If you are Carol Knapp… or you know Carol Knapp… let me know. This bread deserves many kudos. Thanks, Carol! This bread can be served as is, but I like mine toasted with butter. But you probably already knew that I liked mine with a little more butter, now didn’t you? Umm amazing. I have a cookbook like that too.. Good idea to PDF the poignant pages. WHy don’t you just have a copy made of the whole thing.. I bet kinkos could do it for under $10.. might be worth the preservation cost. And I think you need to bake me a loaf.. since I rarely bake. Just found your blog yesterday, and I love it ! I am just getting started with mine, but I think we’re pretty much on the same track. I will be checking back regularly for inspiration.